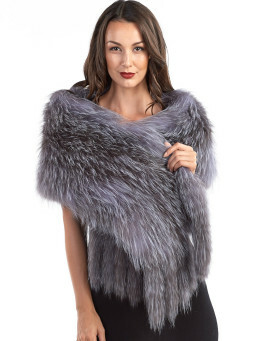 Wrap yourself in luxuriously soft genuine fox fur and smooth satin. This dark black fox piece is flexible enough to add to casual or formal attire. Fox is one of the softest and fullest furs available. Karlie is perfect to pair with your streetwear or an evening gown for a lavish touch at the next party you attend. This piece will definitely make a statement and turn heads! 4.5 / 5 from 3 customer reviews. "This is a beautiful wrap. Very soft and full. The company was great to deal with and shipping was fast. 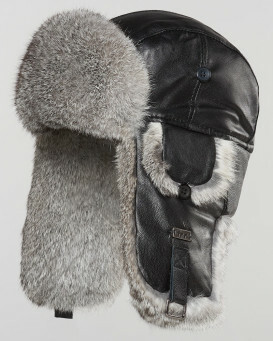 Would buy from Fur Hat World again." "Good-quality garment. 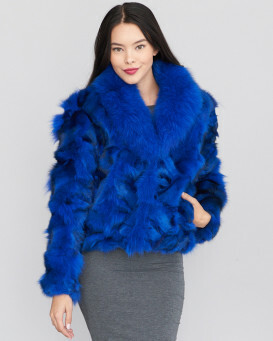 The fur was very soft. This would suit a small lady with very narrow shoulders. I returned it because I found it sat too high up the sides and back of my neck - it would not sit flat on my shoulders. I would not have been able to wear it off the shoulder like the picture because the collar would have been too short to look nice tied that way. I exchanged it for a different item and was very pleased with this company's no-hassle, return/exchange experience. I will not hesitate to shop here again." "Excellent product and customer service. I will buy again from you guys. Thank you again for your fast service."